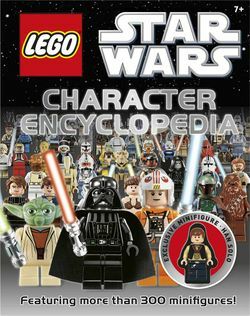 The 5000214 LEGO Star Wars Character Encyclopedia is a book released in 2011. The book showcases every minifigure ever released in the Star Wars theme, and includes an exclusive Han Solo Episode 4 Celebration minifigure, much like the exclusive Luke Skywalker from Episode 4 that was included with LEGO Star Wars: The Visual Dictionary. Several mistakes are present throughout the book, such as the Siege Battalion Trooper being stated to be from the "42nd Siege Battalion" as opposed to the 442nd. In many releases of the book no minifigure has been included. This has notably occurred in some WHSmith stores in the UK. This may be due to them being stolen, or mistakes being made during the manufacturing period. The book states at one point the 7171 Mos Espa Podrace was made in 2001 instead of 1999. On C-3PO's page it says that he was made in 2001 instead of 2000. It also states that the variant shown was included in 8092 Luke's Landspeeder, but it actually came from 10188 Death Star. This can be explained through the different shading in his hands. On Greedo's page states that he originates from Mos Espa Cantina instead of Mos Eisley Cantina. Facts about "5000214 LEGO Star Wars Character Encyclopedia"